Best chocolate cupcakes! This easy one-bowl recipe is so much better than a mix. 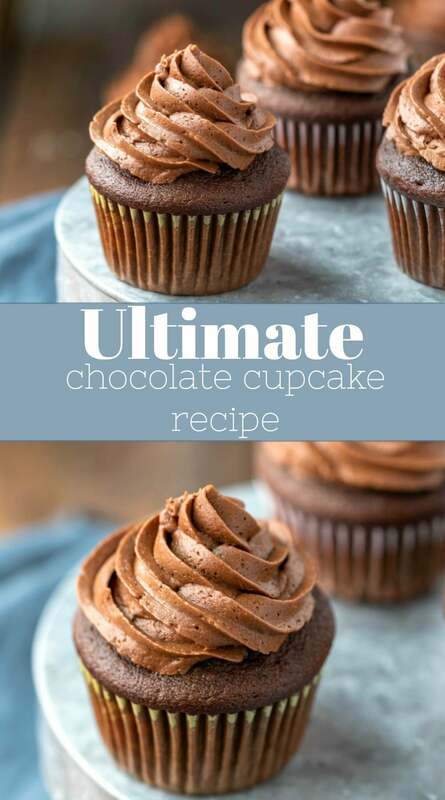 It makes homemade chocolate cupcakes that are moist and rich in no time! Originally published 12/15/16. Last updated 3/16/19. I’m all for crazy cake flavors, but sometimes I just want a classic. I’m a fan of homemade yellow cake, but there’s nothing like chocolate cake! However, finding a good chocolate cake recipe can be difficult, and I’ve made my fair share over the years. 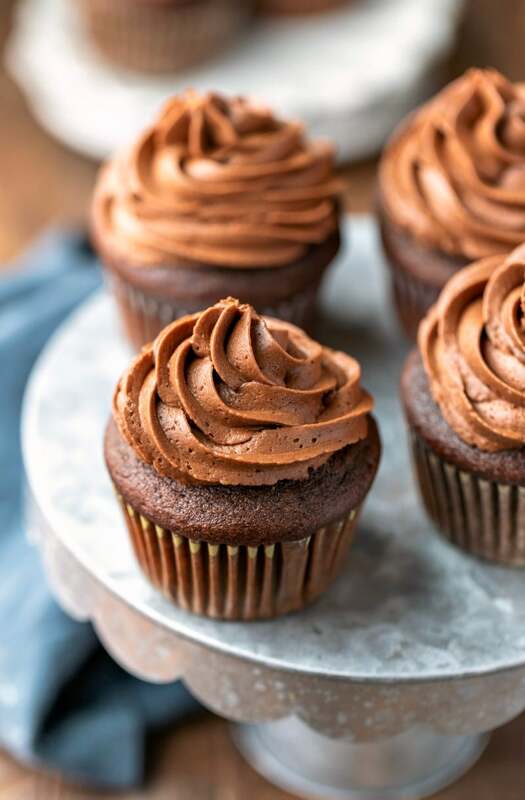 These Easy Chocolate Cupcakes both easy and delicious. 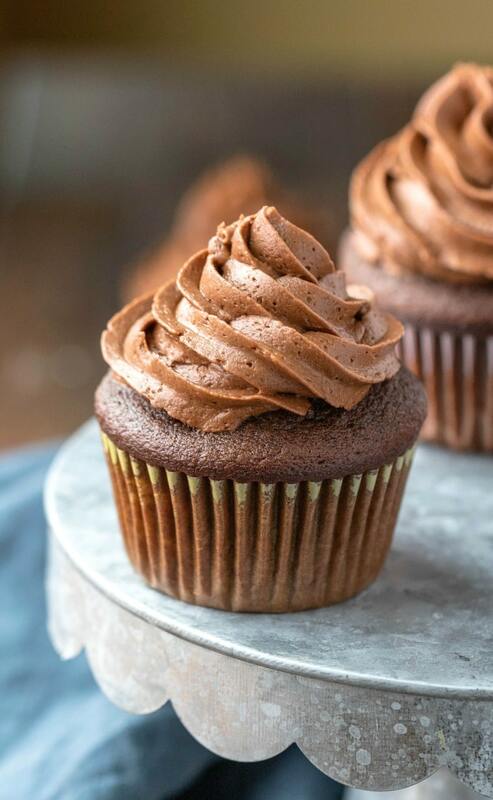 They are moist not-too-sweet chocolate cupcakes that can be made in one-bowl, which makes them quick and leaves you with fewer dishes to wash. These cupcakes are so good and so easy, you may never want to make cupcakes form a mix again! All of the refrigerated ingredients should be at room temperature before beginning. This means that they should be approximately 68-70 F.
The butter shouldn’t be warm and melty, but it should be at room temperature to allow the butter and sugars to properly incorporate. Begin by beating the butter and sugars together until well-combined. This should take about 3-4 minutes on medium speed. I recommend scraping the sides down between each step. Mix in the eggs one at a time, and then mix in the vanilla extract. Next, beat in the buttermilk, sour cream, and warm water. The water should be warm (not quite bath water temp), not hot. Then, stir in the flour, cocoa powder, baking soda, and salt. 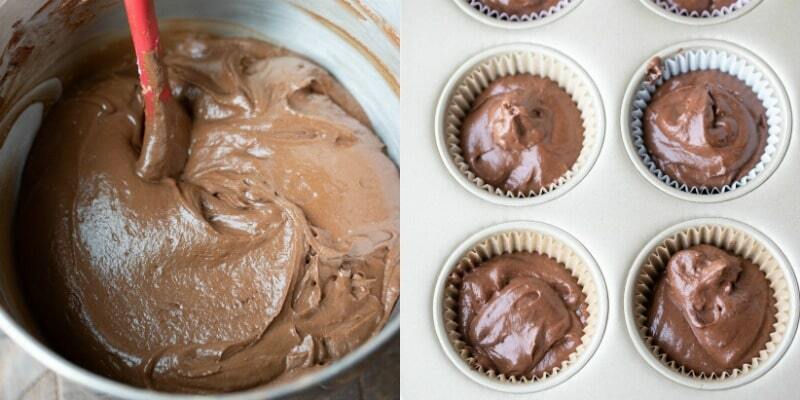 Divide the batter between the prepared baking cups. I like to use cupcake liners with this recipe. 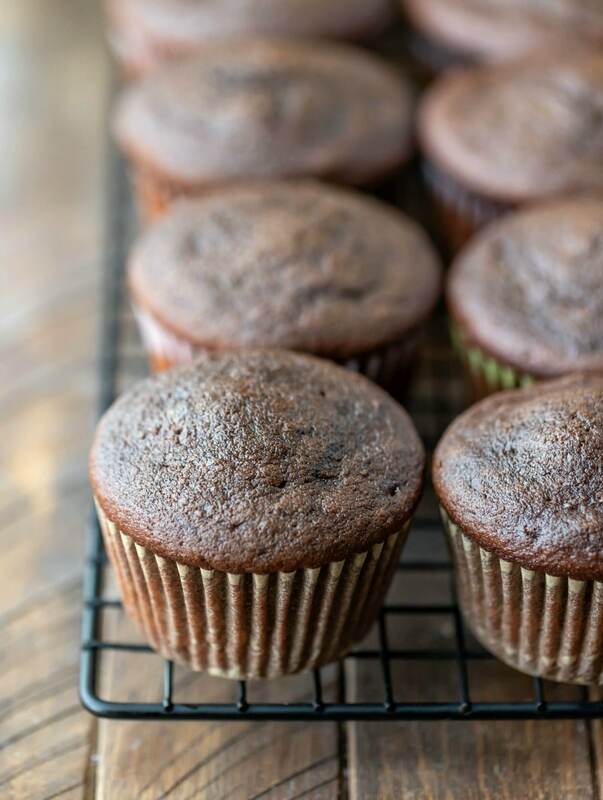 My favorite cupcake liners are parchment with a nonstick finish. If you want to grease the cups instead, use either grease and flour or a baking spray with flour in it. Bake the cupcakes until the tops spring back when lightly touched and a toothpick inserted in the center comes out clean. For this recipe, the refrigerated ingredients should be at room temp. This means about 70 F.
However, you don’t want the butter to be warm. When the butter is smooshy and almost melting, it’s too warm. I recommend mixing the dry ingredients in by hand to avoid overmixing. Overmixing can cause dense, chewy cupcakes. Be sure to properly measure the flour. I recommend weighing the ingredients for the most accurate results. If measuring by volume, sift the flour, lightly spoon into a measuring cup (avoid packing it in), and then level it off. Too much flour will give you a dense, dry cupcake. What makes these cupcakes so moist? A combination of the sour cream, buttermilk, and water help to make these cupcakes moist and tasty. Frostings that pair well with these cupcakes! 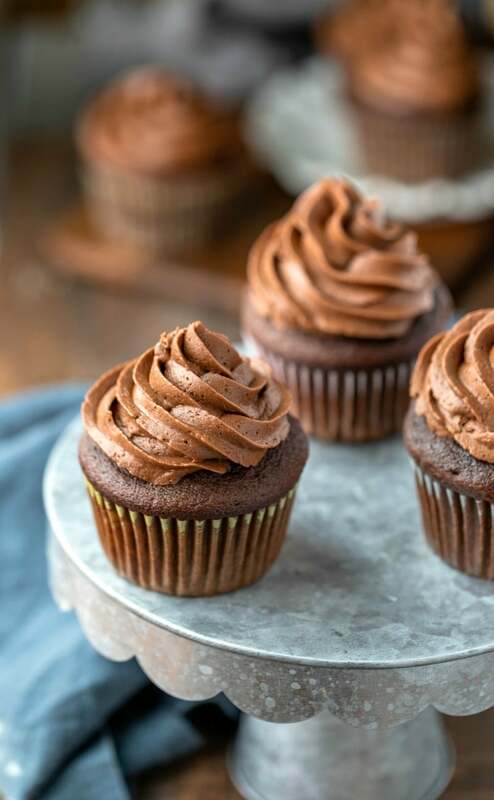 If you’ve tried this easy chocolate cupcake recipe, don’t forget to rate the recipe and leave me a comment below. I love to hear from people who’ve made my recipes! 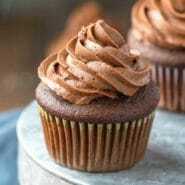 Moist chocolate cupcake recipe that's so easy to make. Check out the tips and step-by-step photos above the recipe. Preheat oven to 350 F. Line 20 muffin cups with cupcake liners. Set aside. In a large bowl, beat the butter and sugars together until well-combined, about 3-4 minutes on medium. Mix in the eggs one at a time until well-incorporated. Add the buttermilk, sour cream, and warm water. Mix in until well-combined. Add the flour, cocoa powder, baking soda, and salt. Mix in just until combined. Do not overmix. Bake about 18-25 minutes, or until a toothpick inserted in the center comes out clean. I recommend using full-fat sour cream in this recipe. Be sure to properly measure the flour to avoid dense or dry cupcakes. Either weigh or sift the flour, lightly spoon into the measuring cup, and then level. Looking for frosting to go with these cupcakes? Get links to my fave recipes just above the recipe. Adding the buttermilk, sour cream and water turned into a lumpy batter that I could not beat smooth. What did I do wrong? Were the buttermilk and sour cream at room temperature, and was the water warm? 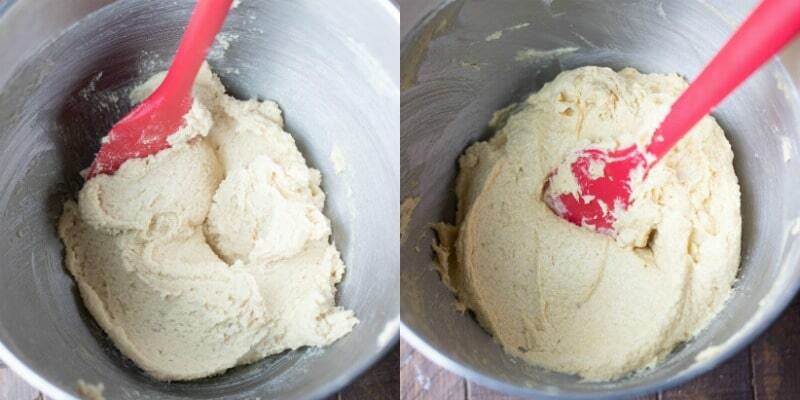 Using cold ingredients could cause the butter to solidify and would create lumps in the batter. The recipe was very easy to do, as the name says. I liked it a lot. Thank you! I’m so glad you enjoyed the cupcakes! =) Thank you for commenting!